GOLMUD, Qinghai: President Hu Jintao made an inspection tour of the Qinghai-Tibet Railway, soon after trains began running on the route on Saturday. Hu stopped at several places, including Yuzhufeng Station, a construction workers' camp in Golmud, a Sinopec refinery and a forestry project centre. The president chatted to workers, asking them about living conditions on the remote plateau, and talked to local people about business and the environment. The first passenger train to enter the Tibet Autonomous Region arrived at Lhasa Railway Station at 0:31 am yesterday, having left Golmud at 11:05 am on Saturday. The first train carried model workers and heroes from the railway's construction 960 kilometres of which is 4,000 metres above sea level and more than 550 kilometres of which crosses permafrost. At the Saturday morning launch ceremony in Golmud, President Hu praised the railway as another magnificent accomplishment in the nation's modernization drive. "The project is not only a magnificent feat in China's history of railway construction, but also a great miracle of the world's railway history," said Hu. Workers attending the ceremony were proud to see their hard work pay off. 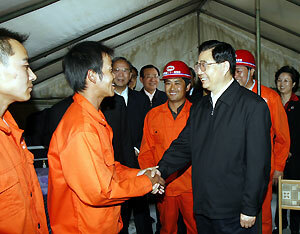 "I am very excited today," said Chen Bingxiong, 36, a construction worker who looked older than his real age. He has spent the past three years working on the railway, returning home just once. "But it was worthwhile," said Chen, who wore blue work clothes, with a golden memorial badge pinned on his left breast. "The railway will be good for Tibet's economic and social development, and will improve life for our Tibetan brothers," Chen told China Daily. The railway has greatly shortened the time it takes to travel between Tibet and other regions of China. "The train makes it easier for Buddhist pilgrims," said Cering, a lama from the Johkang Monastery in Lhasa.